Adjustable Pro Retractable Banner Kits - 33.5" x 72"
The most versatile retractable banner kit we sell, perfect for professionals who need a long-lasting display that allows easy graphic changes. Printed in full color on our smooth 15 oz PET material with blockout layer for 100% opacity. 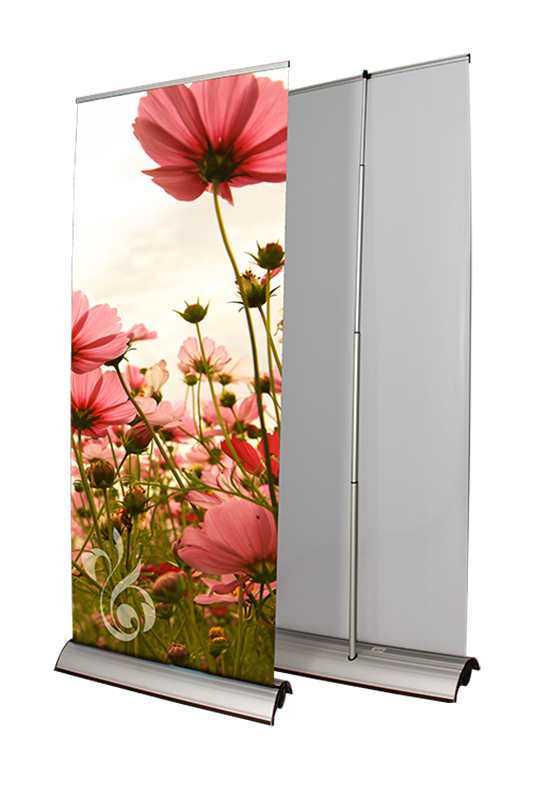 The display area is 33.5" wide with an adjustable height of 36" up to 72". Your banner is held fast by a snap rail system allowing you to remove and replace your banners as often as needed. Setup is easy: simply insert the support pole into the back of the base and hook the banner rail to the top of the support pole. Hardware includes one year warranty! Single-sided only. Kit includes banner, stand, and soft padded carrying case. Replacement banners for this stand can now be ordered online. Imprint Area :33.5" x 72"